Giftah.com is now giving users cash for their unwanted iTunes gift card. Whether you prefer another music service or obtain your music from “other sources” iTunes gift cards can sit around gather dust for years. Sure iTunes has a ton of content but who does not appreciate the freedom and choice that money provides, you could buy some more one hit wonder singles on iTunes, or you can use the money to buy whatever you want at whatever store you want. 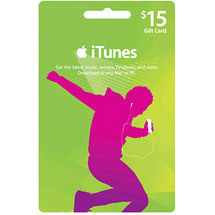 We will accept any gift card that can be used on iTunes, regardless of if its for iBooks, iTunes or the Apple App Store. Don’t let you iTunes gift cards site in a drawer when you can turn them into cash. Unlock iTunes gift cards hidden value and sell your iTunes gift cards on Giftah? Just mail the iTunes gift card to Giftah, as soon as your card has been verified you will be paid via Paypal, all payments are issued within 24 hours of receipt. iTunes gift cards from the United States and Canada are accepted, if you have any questions or need assistance contact our customer service team at 1-866-928-GIFT. Giftah.com is here to help you turn your unwanted gift cards into cash! 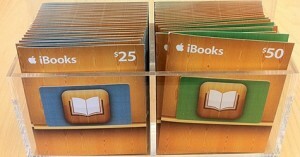 Apple is now offering Apple iBooks gift cards specifically targeted to their new ebook marketplace. Although Apple’s iTunes gift cards could already be used to purchase books in Apple’s iBook marketplace the new cards remove any ambiguity that may have existed and also provide a better fit for consumers interested in using their iPad primarily as an ebook reader. There is no word yet on whether the iBook gift cards can be used for music on iTunes or apps in the App Market, but given Apples moves to remove these barriers it seems likely that the iBooks gift cards can be used to purchase anything in Apples marketplaces. If you have some iBooks or iTunes gift cards you do not plan on using be sure to visit Giftah.com and turn your unwanted gift card into cash. You can sell iTunes and iBooks gift cards which frees your purchasing power up to buy whatever you want. If you are not sure what to buy on iTunes consider turning your Apple iTunes and iBooks gift cards into cash! 1) Check Krispy Kreme Gift Card Balance By Phone, Call 1-800-4KRISPY. 2) Check Krispy Kreme Gift Card Balance At Any Krispy Kreme Retail Location. If calling the Krispy Kreme customer service number please note that standard business hours apply for checking the balance on your gift card. Currently the balance of your gift card can not be found online even if you create an account on the Krispy Kreme website. Once you have the balance of your Krispy Creme gift card consider exchanging your gift card for cash. You can sell your Krispy Creme gift card on Giftah.com, freeing your money so you can buy something that won’t give you a heart attack. If insist on getting some donuts or coffee be sure to check out Giftah’s website for discount Krispy Creme gift cards to see if you can save money on your next purchase.